This article is about the Australian reserve. For the Canadian territory, see Barren Grounds. The reserve is part of the 7,334-hectare (18,120-acre) Budderoo and Barren Grounds Important Bird Area which contains large numbers of endangered eastern bristlebirds, as well as smaller numbers of pilotbirds and rockwarblers, in a mosaic of sandstone heath and eucalypt woodland habitats. ^ Budderoo National Park, Macquarie Pass National Park, Barren Grounds Nature Reserve and Robertson Nature Reserve plan of management (PDF) (Report). 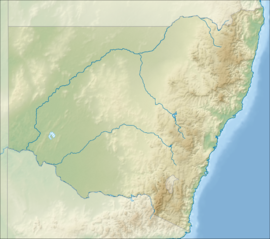 New South Wales National Parks and Wildlife Service. October 1998. ISBN 0-7310-7654-0. Retrieved 3 February 2012. ^ "IBA: Budderoo & Barren Grounds". Birdata. Birds Australia. Archived from the original on 6 July 2011. Retrieved 2011-06-07. Wikimedia Commons has media related to Barren Grounds Nature Reserve. This page was last edited on 25 May 2018, at 19:43 (UTC).